At What Age Can Kids Walk Alone? The first time a parent sends their child to walk to school or around their neighborhood on their own, it can be scary. It’s difficult to know when kids are old enough to take the walk alone. And it has a lot to do with the parents. Helicopter parents — parents who believe they should be heavily involved with their children’s lives — may think kids should walk with parents until they are as old as 15. While “free-range” parents — parents who believe they need to give children more independence and autonomy — may think kids should be allowed to walk alone as young as nine. Federally, there is not a legal age for when children are allowed to in public walk alone during the day. But that doesn’t mean this issue doesn’t have any legal implications. As MamaBear covered early this year, a set of Maryland free-range parents found themselves in legal trouble after permitting their children to walk home alone. So, how do you know what is right for your family? While many parents are afraid to allow their children walk alone because of concerns about kidnapping, The Washington Post says this shouldn’t necessarily be the primary concern. It is extremely unlikely that a child walking alone will be abducted. In cases regarding missing minors, less than one percent of cases involve a stranger abduction. Ninety-six percent of missing minors are situations related to runaways or other family issues. The real danger in children walking alone is street safety. The National Highway Traffic Safety Administration (NHTSA) suggests that parents wait to allow their children to start crossing the street on their own at ten years of age. This is the age that it is believed that kids begin to have enough maturity and brain development to form a better understanding of road dangers — which are serious. According to Safe Kids Worldwide, an estimated 61 children under the age of 19 are injured as pedestrians every day. Their report also says that as kids age, they are actually at an increased risk of being injured as a pedestrian. Their report showed that 14-year-olds were the most likely age group to be injured while walking. When it comes to deciding on an appropriate age, there is no perfect answer. It will be different for each family and child based on the maturity level of the child and the values of the parents. But one thing will be true for all families. It is important to teach street safety rules to children at all ages, and the lessons and reminders need to follow children into their teen years. Before crossing a street, look left, then look right, then look left once more. Be aware of cars making a right turn, they could be behind you as you cross. And listen, too. Do not run across the street. If you think you need to run to make it across the traffic, don’t go. When crossing the street in front of a stopped car, make eye contact with the driver before crossing. Always walk on the sidewalk when it is available. If there is not a sidewalk, walk facing traffic so you can step away as vehicles pass. Only cross the street at crosswalks. And don’t assume cars will stop just because you are in the crosswalk. Wait for them to come to a full stop in both directions. Always be aware of your surroundings. Do not assume that cars will always be where they are supposed to be on the road. When crossing at intersections, always look for cars that may be turning. If listening to music when walking, only put in one ear bud so you can hear what is happening around you. Do not text, look at your phone, or talk on your phone while you walk near streets. It may not seem distracting while walking, but using a phone requires eyes, ears and concentration, all of which you need to be safe around traffic. Avoid walking in the dark. If you must, wear reflective or bright clothing. Parents can find additional peace of mind by using MamaBear, The Ultimate Parenting App™. With the free app, available for iPhones and Androids, parents can receive automated notifications based on GPS technology that alerts them when their child has reached their destination. 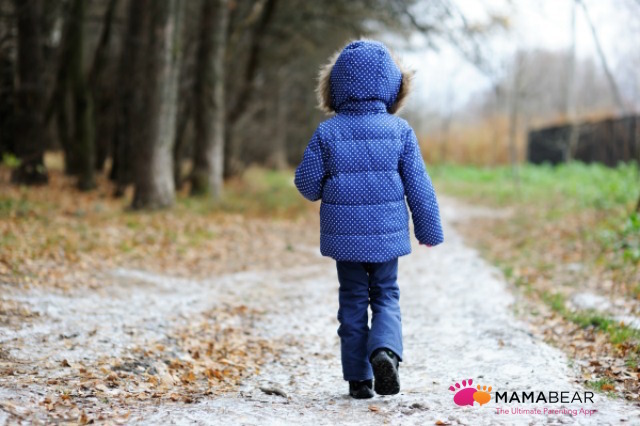 It’s never easy to see your child walk off alone, but MamaBear helps make it less stressful and more liberating for both child and parent.